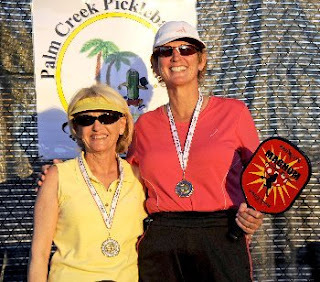 Atlantic South Region: Another Amazing Pickleball Story! Ambassador Earl Cunningham included me in an e-mail he sent to his pickleball players in Gastonia, NC, showing them "Loretta's pickleball court on an unused tennis court" in Lenoir, NC. Curious - I sent an e-mail to Loretta Savary and asked her for the story behind the picture............ The story is so similar to what we hear from so many players across the country.............but each one is unique in it's own way..........Enjoy! We both retired in 1999 and started RV'ing. After seeing the country for years at a time - we started visiting resorts where I took up my High School sport of tennis. The next winter my husband (Ron) & I decided to travel to Arcadia FL (we used to live/work in Cocoa Florida). They had a tennis court taped off - and some players. My husband finally decided to play - YEA and he's very good as well!! So we probably taught about 50 people the game and enjoyed it all last year. Once we got to our home in Lenoir, NC - there was only pickleball in Gastonia - an hour and 1/2 away. So we went every Wednesday (met Earl) and took several of my tennis buddies with me - and everyone got hooked. Now we needed a court. We went to the Mulberry Recreation Center in Lenoir and talked to Maury Patterson who gave us an unused tennis court. Ron & I used over 30 gallons of bleach and pressure cleaned for over a week. We purchased the net, paddles, balls and have just started playing on the court - Wednesday's. Now I will starting teaching the game and setting up established times once I find out what works well with most of the players."